In the manner of David Altenstetter Augsburg, Germany, d. 1617. Mirror, ca. 1600. Enamel, silver, and gilt. Milwaukee Art Museum, Purchase, with funds from Avis Martin Heller in honor of the Fine Arts Society. Photo credit John R. Glembin. Late last year, the Milwaukee Art Museum acquired a truly one-of-a-kind object: a Renaissance mirror that is on display in Gallery #2. Created around 1600 in the metalworking center of Augsburg, Germany, it demonstrates the technical skill and fantastic design indicative of the region. The mount includes cherubs, mythological figures, and foliate designs that masterfully come together in one fabulous whole. These decorative elements are most likely based upon contemporary books published by German artists, which in turn are Renaissance in style because they draw inspiration from antiquity. In particular, the basse-taille technique (when colored glass fills a pattern engraved or carved into the metal), which is used on the inner frame, makes this mirror a rare object. This high-quality version of the enamel was pioneered by the Augsburg goldsmith David Altenstetter (ca. 1547-1617). Only a handful of objects in museums world-wide incorporate this type of enamel-work, which puts the Museum in the company of institutions such as the Wallace Collection in London and the Kunsthistorisches Museum in Vienna. The mirror was the last piece in private hands that was once part of the Richard and Erna Flagg Collection of European decorative arts. It is an appropriate addition to the “Renaissance Treasury” of the Museum that the Flaggs made possible. But comparing it to the clocks, tableware, boxes, cabinets, and religious objects on view in the same gallery raises the question: why would a Renaissance noble want an elaborately mounted mirror in his Schatzkammer, which is a collection of precious objects put together to impress just as a Wunderkammer would have? What would a mirror mean to someone of the time? Today, we have mirrors all around us. But there was a time when that wasn’t so! The first mirrors were the surface of water. This is illustrated by the myth of Narcissus, the beautiful youth that sees himself in the water while drinking and becomes transfixed; he cannot move and eventually becomes the flower, Narcissus, or as we know it, the daffodil. John William Waterhouse painted the myth in 1903. There is evidence that various peoples used polished black obsidian for mirrors for centuries (obsidian is essentially a naturally occurring glass). Shiny metal was also used; some of the most well-known mirrors were made by the Etruscans, one of the Italian cultures that flourished before the ancient Romans. Although the Romans were able to blow and cast glass, their glass was not free of imperfections and their mirrors were small and crude. The first large-scale glass mirrors with a reflective metal backing were made in the 14th century. They were convex because glass was blown. It wasn’t until the 16th century that the technology to produce large, flat pieces of glass with few imperfections was mastered by the Venetians. It was during the 1500’s that mirrors started to look like modern mirrors. But we must remember—glass mirrors were very expensive. For years the Venetian glass makers jealously guarded their secrets to glass making. It is not surprising, therefore, that a wealthy aristocrat would purchase an expensive, artistic frame to show off a mirror in his home. Visitors would have known that the mirror warranted such care and celebration! 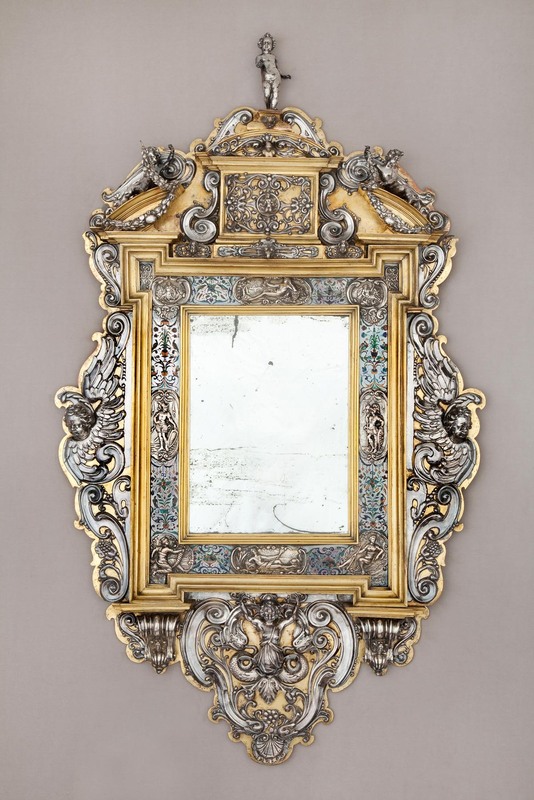 Even in the 17th century, mirrors were a luxury item. In the late 1600’s, the French King Louis XIV built the “Hall of Mirrors” at the Palace at Versailles. The Hall was where the king would hear requests and host special events. The extensive use of mirrors in the hall dazzled visitors by reflecting the light from the many windows and impressed with his wealth and power. But cost isn’t the only reason for the high status of a mirror. Mirrors have long been powerful as the focus of superstitions, traditions, and legends. Because a mirror shows reality—but in reverse—it was believed to be a door to other worlds. And since early mirrors, made before glass was clear and smooth, gave a dark and distorted reflection, you can imagine how someone would have been disturbed by what he saw. Breaking a mirror will give you seven years of bad luck—or so we’re told. This is because if the mirror is destroyed, your soul could be trapped in that reflected world and would not be able to return to you. During the Victorian period, mirrors were draped with black fabric so that the soul of the departed would not be trapped. Covering mirrors is also a mourning tradition in the Jewish faith. The mysterious way of the mirror naturally made it a tool for the practice of witchcraft. Combine that with the sin of vanity, and you have a tool of the devil. You don’t have to look any further than the fairy tale of Snow White to see how mirrors combine the search for the beautiful through magical and malevolent means! Mirrors are such a powerful symbol that they are often used by artists within their compositions. In an extraordinary print of 1510, Hans Baldung (German, 1484–1545) shows us in great detail a Witches Sabbath—and there, at the bottom, is a convex mirror reflecting and instigating the action. One of the most famous mirrors in art history is the convex mirror on the far wall in The Arnolfini Portrait by Jan van Eyck (Flemish, active 1442-died 1441), which possibly reflects the figure of the artist himself. Van Eyck was probably looking to impress the viewer with his skill in showing things outside the actual picture. Diego Velázquez (Spanish, 1599-1660) uses a mirror in Las Meninas in much the same way. Josiah McElheny (American, b. 1966), Modernity circa 1952, Mirrored and Reflected Infinitely, 2004. Hand blown mirrored glass objects, chrome metal display, glass and mirror. Milwaukee Art Museum, Gift of Contemporary Art Society. Photo credit Tom Van Eynde, Donald Young Gallery. 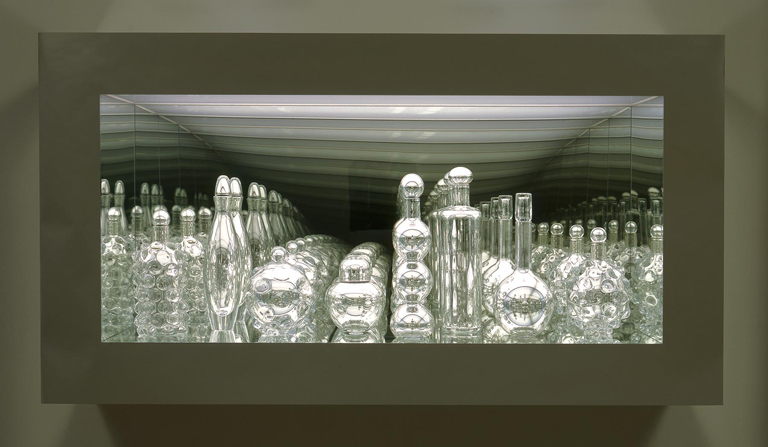 © Josiah McElheny. Venus is often shown with a mirror. It’s very fitting that the goddess of love should always look her best, but sometimes it’s hard to tell if she’s looking at herself, or at the viewer! The same can be said, I think, of our lovely German Rennaissance mirror. I hope you’ll take a look the next time you are in the galleries! This entry was posted in Art, Curatorial and tagged German Renaissance, McElheny, mirror history, mirrors, mirrors in art. Bookmark the permalink. Very nice design of this mirror its good that you shared and posted the nice written on it.